So, as expected, the selectors have stayed away from making wholesome changes to India’s Test squad while announcing the line-up for the two games against Windies. The 15-man squad is for the series against Windies, but the larger picture is the tour to Australia that follows. In some ways, it’s the mark of a new beginning – quite literally, as it means a change in their opening combination. Mayank Agarwal has finally made the cut, and either he or Prithvi Shaw is definite to make their India debut in the Tests to come. Agarwal’s selection in place of Shikhar Dhawan, the Player of the Tournament in the Asia Cup, are signs that the selectors will refrain from picking players for red-ball cricket based on their white-ball form. In all likelihood, Dhawan would have feasted on Windies bowlers in home conditions, but history shows it’s hardly any guarantee of success overseas. M Vijay, who was dropped after two Tests in England, has made four consecutive scores of 50+ in county cricket, but India are now investing in youth. Thus the hosts will have a new opening pair, with KL Rahul set to open with one of the debutants. It could be the end of one of the most established opening pairs. Vijay and Dhawan have added 1459 runs from 40 innings together, at an average of 37.41 including two century and six half-century partnerships. That average, however, reduces to 26.2 in Tests in SENA (South Africa, Australia, England and New Zealand) countries. Add Rahul himself to the mix, and India had three settled openers who made it tough for other aspirants over the last four years. Dhawan and Rahul average 49.93 as an opening pair, but that number again reduced to 28 in SENA. Vijay and Rahul, the other axis of the triangle, found lesser success together as they averaged just 21.4 in 22 innings together. It was these three who dominated the opening position over the last five years – two of the three have opened in 77 of the 96 innings in the last five years, with Gautam Gambhir, Abhinav Mukund, Parthiv Patel and Cheteshwar Pujara making the occasional appearance in the rest. Yet, even with established opening options, India haven’t been able to succeed as expected overseas. The struggles in SENA can be summarised in one stat: the last century opening stand for India in these countries came way back in 2010, through Gambhir and Virender Sehwag at Centurion in 2010. Now, in all likelihood, India will head to Australia with two inexperienced opening options in Agarwal and Shaw, along with Rahul who has struggled abroad barring the last-Test century in England. It’s no doubt a tough initiation into the Test world for Shaw and Agarwal. In many ways, their situation is similar to Abhinav’s when he began his Test career in 2011. Abhinav's first five Tests were all overseas - three in West Indies and two in England, when India lost 0-4. His scores included a 48, and 62 in West Indies and a 49 at Lord's, but lost his place to Sehwag and Gambhir, and later Vijay and Dhawan and Rahul. Abhinav has played only two Tests in the seven years since. But is the trial by fire necessarily a bad thing? Shaw and Agarwal need to look no further than the other end for inspiration; Rahul himself made his Test debut in Melbourne in 2014, and scored a brilliant century in just his second Test. Moving on down the line-up, the top order selects itself but Cheteshwar Pujara and Ajinkya Rahane have to show more consistency to support Virat Kohli. Rahane’s overseas numbers have always been better than those at home – he averages 40.9 abroad and 32.87 at home – but even those have come down in recent times. In the current cycle of overseas Tests, Rahane has scored only two half-centuries in 13 innings. He’ll have to look within and find the player who made 399 runs in four Tests down under in 2014. Pujara, Kohli and Rahane’s form becomes even more crucial given the inexperience before and after them in the order. Hanuma Vihari holds his spot in the middle order, while the other talking point being the unfair treatment of Karun Nair. Nair was selected in the squad for the England tour ahead of Vihari but has been dropped despite not playing a single game. Fairly or otherwise, it’s clear India are backing Vihari at No. 6, especially if Hardik Pandya remains unfit. More inexperience follows in the middle order with Rishabh Pant being the obvious choice for the wicketkeeper slot. 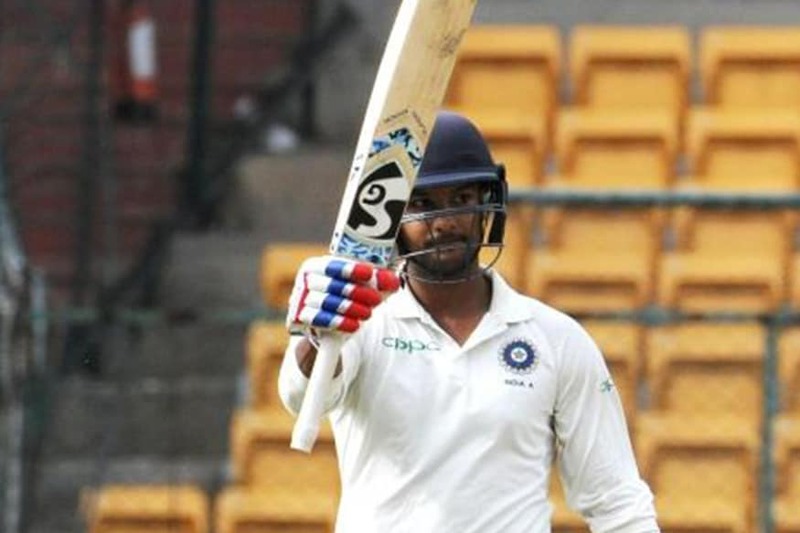 Pant made it his own with a century in the last Test in England, but with Wriddhiman Saha remaining unavailable and Dinesh Karthik losing his spot after a poor England tour, it’s clear India lack back-up options. Home Tests don’t require a back-up keeper option, but the race will be back for the Australia tour. That the selectors haven’t picked any medium-pace bowling all-rounder despite Pandya’s injury betrays lack of similar options too. Tamil Nadu all-rounder Vijay Shankar was picked in the squad for the home Tests against Sri Lanka and the Nidahas Trophy T20Is whenever Pandya was unavailable over the last season, but hasn’t made the cut here. A recent string of injuries, the most recent being a hamstring injury in the India A tour of England, might have worked against him, but it signals that India are not yet looking beyond Pandya. Unlike their batting counterparts, the bowling unit is largely settled. They’ve been the reason India have remained competitive in South Africa and England this season, and seem to have good back-up options as well. The three spinners – R Ashwin, Ravindra Jadeja and Kuldeep Yadav – are pretty much straightforward choices. Even with Jasprit Bumrah and Bhuvneshwar Kumar rested, India have two experienced pacers in Mohammed Shami and Umesh Yadav, with the uncapped Shardul Thakur and Mohammed Siraj as other options. Umesh, in particular, will be keen to be considered an option for overseas Tests too. Umesh played 17 of the 19 Tests – including 12 off the 13 games in the marathon home stretch - in Asia between September 2016 and end of 2017 picking up 41 wickets, but was in the XI only for two of the eight Tests in South Africa and England this season. Just like the entire team, he too will be playing West Indies, with one eye firmly on Australia. Bumrah Set to Return, But Are India Being Fair on Umesh?